user warning: Table 'drupalgastronomer.comments' doesn't exist query: SELECT COUNT(*) FROM comments c WHERE c.nid = 160 AND c.status = 0 in /home/dgabriner/gourmetgastronomer.com/modules/comment/comment.module on line 992.
user warning: Table 'drupalgastronomer.comments' doesn't exist query: SELECT c.cid as cid, c.pid, c.nid, c.subject, c.comment, c.format, c.timestamp, c.name, c.mail, c.homepage, u.uid, u.name AS registered_name, u.signature, u.picture, u.data, c.thread, c.status FROM comments c INNER JOIN users u ON c.uid = u.uid WHERE c.nid = 160 AND c.status = 0 ORDER BY c.thread DESC LIMIT 0, 50 in /home/dgabriner/gourmetgastronomer.com/modules/comment/comment.module on line 992. This is a recipe from Cooking Up A Storm, a new cookbook compiled by the food editors of the New Orleans Times Picayune. The cookbook is great: it's made up of recipes requested by readers of the Times Picayune, attempting to gather up the beloved New Orleans recipes that had been lost to the storm or simply lost to history. Judy Walker and Marcelle Bienvenu, the cookbooks editors, combed through these recipes to include the most popular and the just plain best - and the result is an excellent cookbook, full of the good stuff that people really eat in New Orleans. Being an okra fiend, I decided to try out the Creole Okra for my first experiment from the book. The results? Delicious. INGREDIENTS: 1 lb okra 2 tablespoons olive or vegetable oil or butter if you're bad 1 onion 2 cloves of minced garlic 1 8 oz can of tomato sauce 1 chopped tomato (my addition) 1 chicken bouillon cube (trust me) 1 cup water 1 tsp salt 1 tsp pepper 1 tsp dried basil (I also used about three sprigs of fresh basil.) 1/2 tsp garlic powder 1/2 to 1 pound shrimp or spicy sausage, or both! Cut up your okra - I like to slice them in half for easier eating - and wash the heck out of them. This helps de-slime them a bit. You may also want to prepare your chicken bouillon: dissolve it in one cup of boiling water. You can cheat and do this in the microwave. I won't tell. 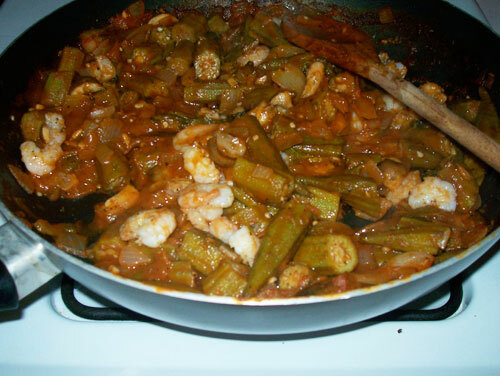 Toss the okra in a big pan and brown them on all sides, heat on high. They may create a mildly distressing slime slick around them but this is perfectly normal. It is just their way. Add the onions and garlic, as well as the chopped tomato, and sauté until soft and translucent. (I also added some sliced baby portobello mushrooms, which may be a crime, but a tasty crime. Once that looks satisfactory, toss in your 8 oz can of tomato sauce and stir it all up. You will also want to toss in the dissolved bouillon. Add the salt, the pepper, the dried and fresh basil, and the garlic powder if you are so inclined. If you like it spicy, toss in as many shakes of Crystal hot sauce as required. You should now have something that looks like this. Cover, reduce the heat to a simmer, and cook for 30 to 45 minutes. If you are using shrimp or sausage, you will want to add it in the last 10 minutes of cooking. I used some nice little gulf shrimp - I sauteed them briefly with some Cajun spices then tossed them into the mix. And here's what you should have at the end of 45 minutes. De-licious. Serve over rice or pasta or whatever floats your boat. Leave out the meat and you've got a great hearty side dish - keep the meat in and you've got an easy one dish meal with some real Louisiana flavor. You really can't lose. A New Take on "Pasta Salad"
Homemade Soymilk - So many possibilities! Sandwich for dinner, s'il vous plait. Bougey Pork and Beans - Yes Please!